The Minneapolis rock band Howler is blowing up — but not in Minnesota. The group's popularity is huge in Great Britain after signing with London-based Rough Trade Records last year. In its hometown, however, Howler's garage rock sound has had a somewhat cooler reception. 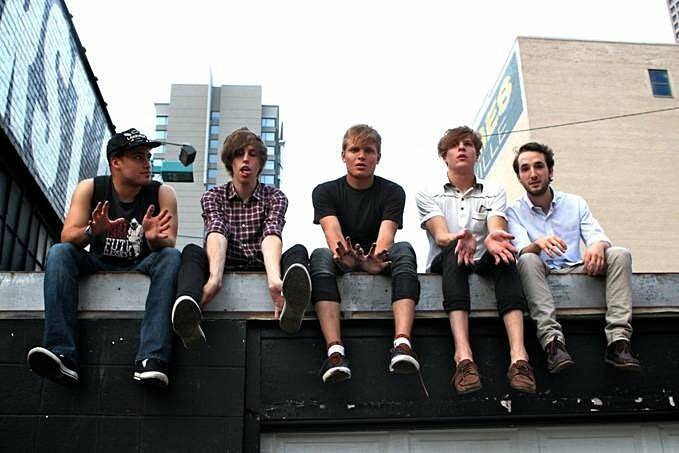 Howler started in 2010 through a chance meeting between frontman, guitarist and lead songwriter Jordan Gatesmith, 19, and keyboard player Max Petrek, 20. They met at a Planned Parenthood clinic with their respective girlfriends and each noticed the other tapping their feet to a 1950s girl group wafting through the office. Their compatibility became even more apparent when they started playing together, and Gatesmith's songs started to flow. After Howler collected a few more musicians, it had enough material for their first public gig, at, of all places, the farmers market. "That was the goal of the band," Gatesmith said. "It's like 'Let's write catchy music so we can make lots of money at the farmer's markets.' "
Suprisingly, it turned out to be pretty lucrative. "We just made tons of money," he said. "People thought the lyrics were really funny and they though that we were being cute and kind of snide all at the same time. They're like, 'Well that's interesting.' "
Snide is a good word to describe Howler. The band sounds like the brash, carefree cockiness of youth captured in a bottle, with a punk snarl and surf style guitar chords thrown in just to up the musical and lyrical attitude. "I think that we're good at writing pop songs," Gatesmith said. "I think we're good at disguising pop songs too. I think we're good at filtering some noise and filtering in some, maybe a little bit stranger lyrics or something, but whatever we write just seems to be a little more upbeat and a little more poppy." "And instantly like, it grabs you right away," says Petrek. "Some songs you have to listen to a few times before you really understand them or get the concept behind it, but I think with a good Howler song, you listen to it once and you're like, 'Oh yah, that's it,' " Petrek said. "I think Howler's pretty instantaneous when you listen to it." Eventually, band members decided to release an EP. That's when lightning hit. "We were just playing a show, and a writer for NME and Pitchfork was there," Gatesmith said. N.M.E. being the British music magazine "New Musical Express." The writer was Jon Garrett. "I'm a freelance writer, contributing to a variety of publications over the past decade or so," Garrett said. "I just attended their EP release show, which was in April of last year." "And he didn't talk to us after the show," Gatesmith said. "Really liked us." "I just saw something on stage that was ... it wasn't quite ready yet but you could tell they had something special," Garrett said. "And I guess what really drew me to them was Jordan just really had this phenomenal stage presence that I don't see very often, especially in younger bands." Without telling anyone in the band, Garrett sent Howler's EP to Jeff Travis, who runs the U.K. label, Rough Trade Records, which ultimately signed the band. "After a couple hours after getting that EP he emailed me back and said 'This is fantastic, we're really excited here at the office, I've played it around, everybody here at the label loves it, what's their story?' " Garrett said. "All of a sudden, the guy who signed "The Smiths," and the guy who signed "Stiff Little Fingers," and "The Strokes" and "The Libertines" is emailing us," Gatesmith said. "So, it was weird." The snotty songs of Howler were soon all over the British airways and not long after that, the band was whisked off to the U.K. to tour with one of Britain's hottest groups, The Vaccines. It was surreal, as Gatesmith recalls. "Playing to these crowds of like 5,000 people, and having these 15, 16-year-old kids, girls mostly, singing along to our music in the front row — that was really weird," Gatesmith said. What stoked the fires for Howler, aside from being signed to one of Britain's most prestigious labels, was Garrett's article for New Music Express. NME named Howler its number three best new band in 2011, and included frontman Gatesmith in its list of the 50 coolest people of the year. A couple weeks ago, the band appeared on the cover. And that carries weight, just ask Mark Wheat, British expat and DJ for The Current. "The NME is, you know not to be crass, but the Bible," Wheat said. "It's bigger than Rolling Stone, really, because it comes out every week." The NME hype can influence other U.K. media outlets, such as the BBC and the Guardian. That can quickly add up to a publicity frenzy, in a small country like Great Britain, Garrett said. "If you get all of those outlets referencing you, playing your songs on the radio, you're gonna get that traction," he said. Also, Garrett said, the British music intelligentsia and fans are always on the lookout for the next guitar rock savior band, a style that's never been out of fashion in the U.K.
Or as Wheat sees it. "Kind of a game-changer band, that's what they're looking for," he said. "That's where I think the pressure on Howler is almost insane right from the start because they're not just, 'Oh, this is a popular artist,' like an Adele or something. They're looking to them actually changing the game. "And I don't know, because Howler, to be quite honest, is so simple and basic a rock band, I don't know if that's gonna pan out." Despite Howler's near-overnight success overseas, the comparative response in the Twin Cities has been tepid. The band's CD release show at the Triple Rock Social Club in Minneapolis Saturday night is all but sold out, but that's about 380 people. Bluntly, the buzz over Howler isn't nearly as intense in the band's hometown. There could be any number of reasons for this. Guitar bands right now aren't as popular in the states as they are in the U.K. Electronic music is more where it's at. Also, Howler hasn't gigged much around the Twin Cities, and to win fans in the local scene, musicians have to prove it on stage. "Do you want to hear my theory?" asks Gatesmith. "Growing up, my joke with all my friends was Minneapolis is where dreams go to die. "We were part of that class of bands that no one wanted to touch," he said. "When someone from that class of bands gets big, everyone's like 'Oh well, we didn't pick them, they weren't picked regionally first, they didn't, you know, do this or that. So everyone's kind of turned off by that I think. That's my theory." There might be some truth to that too. Gatesmith is confident that he and his bandmates are keeping level heads, despite the attention. He doesn't want Howler to become his career, and predicts possibly four albums with the band before it'll be time to move on. "I do want Howler to be this youthful project and I want it to stay this way," he said. I don't like bands that start when they're 18 and go until they're 62." Reminded that four albums could take 10 years to make, including its newest, "America Give Up," which would make him 29-years-old, Gatesmith responds, "better make it two then."